This profile is meant to be read *after* you’ve read our Rocket Raccoon profiles. 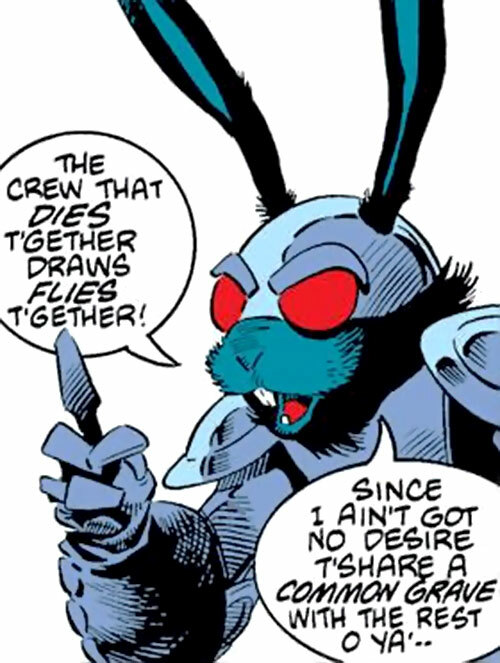 Group Affiliation: Former leader of the Black Bunny Brigade, briefly the leader of “Blackjack O’Hare’s Awful Eight”. Height: 4’ Weight: 50 lbs. O’Hare is an experienced combatant and a good gunfighter, with a potent laser pistol. His small size and mobility make him difficult to hit with ranged attacks. This profile’s game stats assume that O’Hare has rabbit-like senses of smell and hearing. However, these were not actually demonstrated in the material. Since he wears some sort of eye protections and rabbit are sensitive to bright lights, the stats also assume a minor vulnerability to light flashes. That his vest has protective capabilities similar to Rocket’s is another assumption. The Black Bunny Brigade originally counted about 8 soldiers/assassins, and was the most competent fighting force seen in the Keystone Quadrant. The rabbits were disciplined, and excellent shots with their laser rifles. O’Hare and his Black Bunny Brigade were apparently the best mercenaries in the Keystone Quadrant. As such, he was one of the main combatants in the toys wars of 1982 and 1985. In 1982 he was working for Judson Jakes, who back then had stewardship of the Inter-Stel toymaking corporation. Jakes sent O’Hare to kidnap Lylla, the legal proprietor of the corporation. 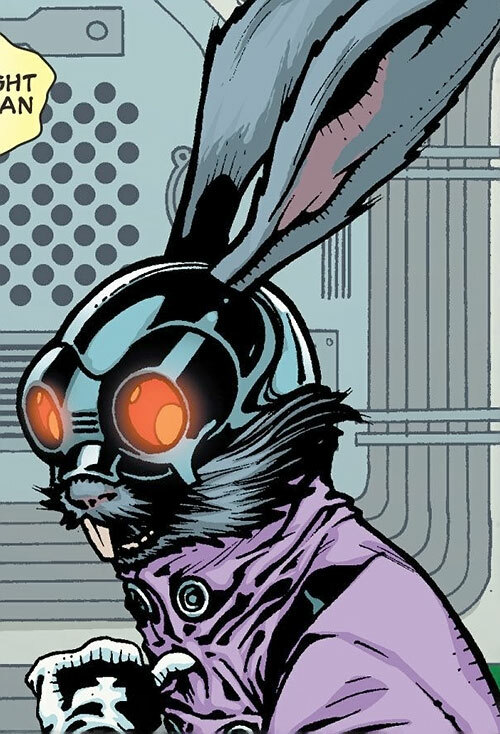 The hare was successful, but Inter-Stel was then attacked by Rocket Raccoon and his allies – the incredible Hulk among those. O’Hare was sent flying when the Hulk punched the ground, and Rocket knocked him unconscious in mid-air. 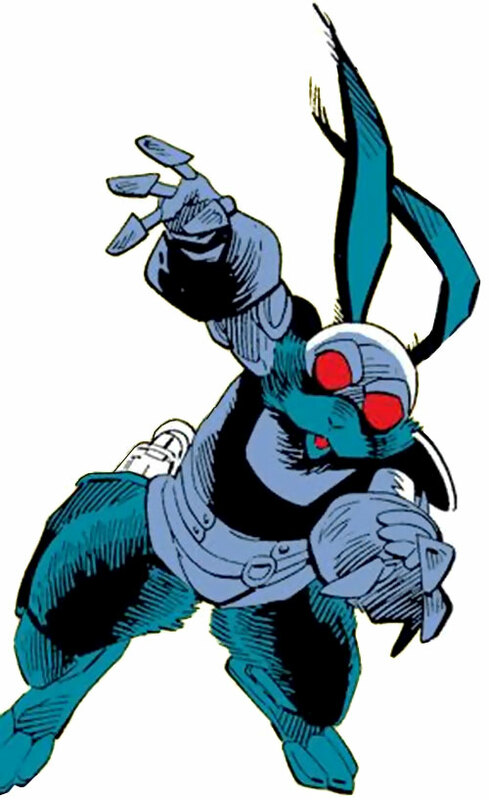 By 1985, the Black Bunny Brigade had been hired by Inter-Stel’s new steward Lord Dyvyne. A major part of their job was to protect him against revenge attempts by Judson Jakes. Dyvyne also decided to kidnap and marry Lylla to own Inter-Stel, and O’Hare again captured her. However, this time the wily O’Hare decided that he would marry Lylla himself. thus, he betrayed his employer. This gambit did not work, and the Black Bunny Brigade was destroyed when it was simultaneously attacked by the forces of Dyvyne and Jakes – and by Lylla’s lover Rocket Raccoon and her uncle Wal Rus. Blackjack was forced to ally with Raccoon to save his fur, and twice allowed Rocket and company to escape certain death. However, he then betrayed them after recruiting new gunsels in an ill-reputed cantina. Rocket and his allies won the shootout and eluded O’Hare, leaving him empty-pawed. As the toys war escalated into final all-out battle, O’Hare realised that he should ally with Rocket Raccoon. If the lawman lost, the new order would mean no employers for the wascally wabbit. 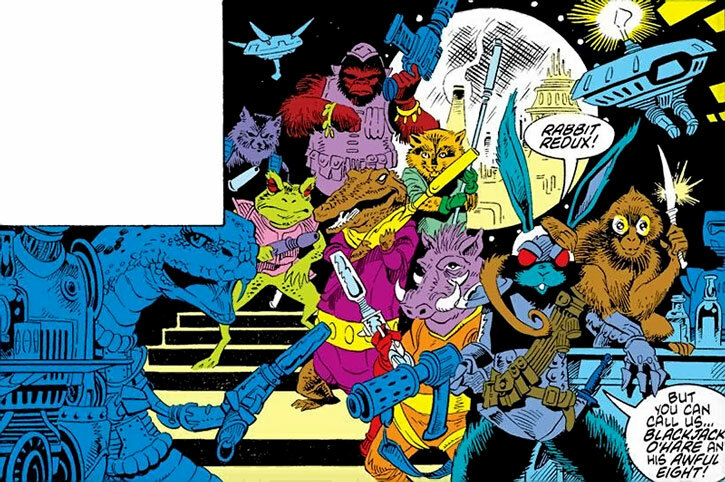 Once the toys war was over and the Loonies were cured, the mercenary even decided to accompany Rocket and his friends outside of the Keystone Quadrant, along with the Robots’ ship. In 2011, the events on Halfworld were revealed to have been a deformed version of the reality. Rocket Raccoon’s memories had been mostly erased by a psychiatric treatment machine that reinvented his past as a children’s tale. 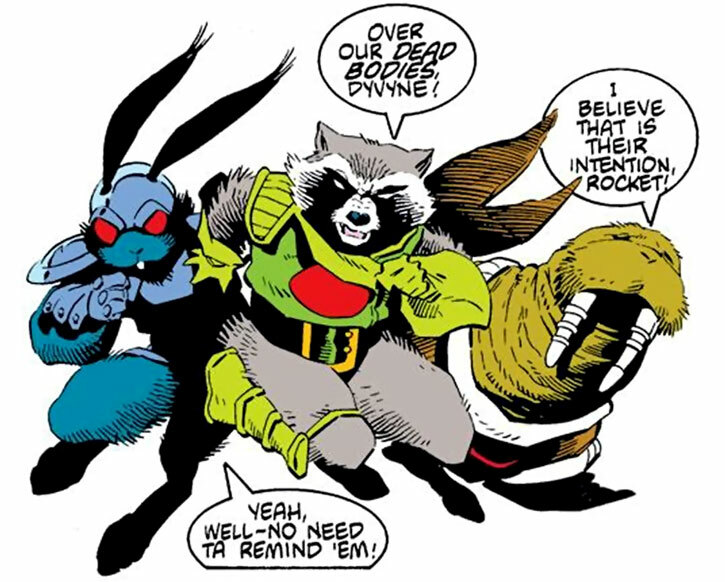 In the real world, Rocket had been the Head of Security for the cosmic-sized Halfworld Asylum for the Criminally Insane, and Blackjack O’Hare was his #2. To contain their immensely powerful patient the Star-Thief (Barry Bauman), Raccoon came up with a plan. But it necessitated erasing his own memories and exiling him. Thus, O’Hare succeeded him. Blackjack eventually married Lylla (a psychiatric nurse) after she got over the end of her relationship with Rocket. When he came back to Halfworld in 2011 and discovered the truth, Rocket soon realised that he was manipulated by the Star-Thief and resumed his command. 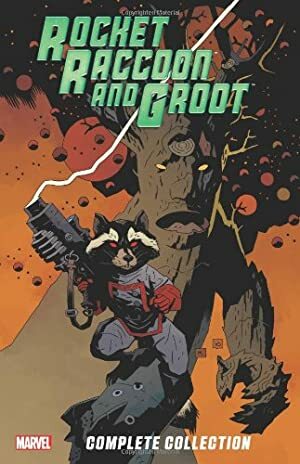 Blackjack, Rocket and Groot defeated the Star-Thief and saved Halfworld. After this exploit, Rocket left to resume his activities as a galactic hero, and O’Hare resumed his command. Blackjack may not actually have hands, as his gauntlets’ fingers look mechanical. If so he wouldn’t be the only uplift in this case, Wal Rus being another example. He wears a sleeve grey leotard with a paramilitary slant to it, plus gauntlets and shoulderplates. A distinctive helmet with ear-holes sit on top of his head, presumably to protect his eyes. O’Hare has an old-fashioned urban blue collar diction, and a very pragmatic attitude. He’s here for the money and maybe the power, and slyly manoeuvres his way toward those. Though he’s a rabbit of few principles, he’s a good ally to have… as long as somebody doesn’t offer him a better contract. He’s generally evil and underhanded, and doesn’t even reliably stay bought. But he’s very rational about it all and will always work in his best interest. In the 2011 continuity, Blackjack was a competent and dutiful security officer, and quite resourceful. He was very loyal toward his old boss Rocket Raccoon. Attack Vulnerability (Flash, -1CS OV/RV), MPR (Blackjack’s small size can be a drawback, but this is rare), MPR (Blackjack is limited to 2 APs of ground speed by his Shrinking). On other planets, Blackjack might have an Appearance Drawback. SKULLCAP W/GOGGLES [BODY 04, Shade: 02]. VEST [BODY 05, Damage capacity: 06, Limitation: Damage Capacity cannot be Recovered, though Blackjack presumably has spare VESTs]. Combat Knife [BODY 04, EV 02 – this blade is sized for O’Hare and thus tiny by human standards]. The bunnies probably had the same stats as a stock grunt, and used laser rifles with the same stats as O’Hare’s pistol. They had Weaponry (Firearms): 04. Writeup completed on the 25th of January, 2014.